The Best Beauty Looks From The Golden Globes 2018 Red Carpet! The 75th Golden Globe Awards was a special night for a lot of amazing reasons. The world was talking about the event much before it happened, all thanks to the Time’s Up campaign started by Hollywood stars. The actresses announced that they would walk the red carpet wearing black as a sign of protest against sexual harassment and gender inequality. The conversation about the movement kept everyone predicting the scene before any look was debuted but beauty looks were still a mystery. Golden Globes 2018 welcomed plenty of glamorous and intricate hair and make-up styles. Show-stopping ones, to be more specific! While the stars focused on speaking for the causes this year, the glam squad still continued to slay the beauty looks. 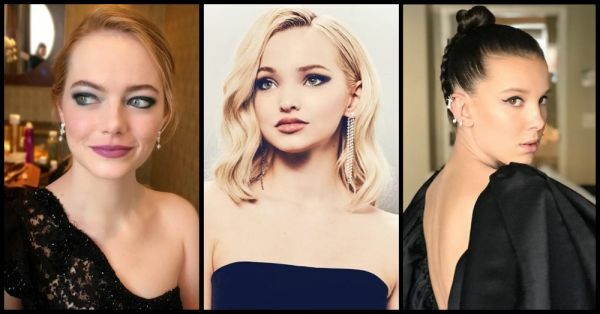 Celebs like Emma Stone, Dakota Johnson, Tracee Ellis Ross, and many more brought highlights to their hair and make-up. Here’s how your fave Hollywood stars nailed it! Emma Stone walked the red carpet with Billie Jean King. For her nails, Emma's manicurist Emi Kudo went with LeChat Dare to Wear Polish in Beauty Bride-to-Be for a light pink effect. For her hair, Emma went back to her redhead roots with an elegant updo created by celeb hairstylist Mara Roszak. Reese Witherspoon walked the red carpet with Eva Longoria. Her hairstylist Lona Vigi, let her hair down with side partition. And her make-up artist Molly Stern kept it simple with a pale pink lip colour and barely-there make-up look. Dove Cameron wore her loose waves in a deep side part created by celeb hairstylist Justine Marjan. Dove went for a dramatic smokey eye and her signature long lashes to complete the make-up look. She kept it simple, by opting for a matte pink lip and pale pink blush. Tracee Ellis Ross kept her beauty look in tune with her all-black outfit, she matched it perfectly with a head wrap. She paired her look with a red lip, smoked-out liner, and dramatic brow. Dakota Johnson went for wispy bangs and a textured updo by celebrity stylist Johnnie Sapong. She kept her skin glowing with a soft smoked-out eye in shades of grey. On her nails, Deborah Lippmann used her eponymous nail polish line in colours Brand New Day and Fade to Black. Kendall Jenner kept her beauty look true to her signature style. Her middle part lob and bronzed glow were in line with her everyday aesthetic, while she made all the difference with a slightly blended-out smokey eye. Katherine Langford had the most eye-catching beauty look of the night. She added a few silver stars to her hairdo, she pinned them along the back of her head and made them the highlight. The way Zoë Kravitz rocked her short and chic pixie cut, she made us all consider that chopping hair off is a great idea. Her orange-red lip played off her emerald earrings, creating an interesting contrast that added to her glow. Emma Watson walked the red carpet with the activist Maria Larasi in an all-black look. Emma showed off her brand-new bangs with a red lip. Millie Bobby Brown's gorgeous make-up look with a bold cat eye is created by celebrity make-up artist Kelsey Deenihan, and it’s all about moisturising. She chose a top-bun as her updo and if you haven’t already noticed, she gave a sporty edge by adding braids to her bun, from behind. Issa Rae had a stunning glow added to her beauty look at the Golden Globes by her make-up artist Joanna Simkin. Along with a full smokey eye, Issa Rae went ahead adding elegance to her look with a clean bun. Emilia Clarke walked the carpet in her Game of Thrones platinum blonde. She styled it in a sleek, single-length, middle-parted lob. A bright pink lip and her equally bright blush kept things glowing. Which look are you planning to try next? We bet you can nail them all!